Merry Basketball Christmas everyone. The NCAA Tournament is underway. We've already seen plenty of craziness, with Auburn doing its best to blow a very big lead in the early slate of games against a New Mexico State team that should have easily taken the game to overtime were it not for a silly decision to eschew a wide-open layup to tie the game for a potential game-winning three pointer. In between me writing this and the story actually being published on our site, it's entirely possible more craziness -- looking at you, Michigan State -- could occur. Thursday night's slate features a whole host of delightful matchups, and it was honestly hard to drill down and find the three I like the best. I should have been 3-0 last week in this column but I got greedy and used Illinois, a terrible basketball team with mostly terrible alumni, as part of a moneyline parlay. Oh well. We can run it back with another parlay in the night games along with an under I really like and a simple play on a tried-and-true tournament team. Let's get to it. You probably think about Villanova as an offensive juggernaut because that's the stereotypical way we think about them, what with Jay Wright having taken this team to national titles in two out of the last three years. And they are good offensively, but not hyper elite like previous editions of 'Nova teams, checking in at just 16th overall in offensive efficiency. They're incredibly reliant on the three-point shot though, with 53.5 percent of their scoring coming from behind the arc. Unfortunately for Wright's squad, St. Mary's happens to be an excellent three-point defensive team, allowing just 31.8 percent of opponents' threes to go in. 'Nova is 333rd in adjusted tempo, which is shockingly low for a team that we just consider to be a run-and-gun offensive powerhouse. The Gaels are even slower at 346th in the country, which means we could get in a rock fight where Nova's top weapon isn't clicking at full speed. This number should be in the 120s. Speaking of totals, the SportsLine Projection Model loves one side of the Montana-Michigan total, with that play cashing in 83 percent of the time in computer simulations. You can get that pick as well as the computer's ATS selection over at SportsLine. This is pretty simple: the Terriers got hosed with their seeding, as they were a line or two lower than they should be. Wofford is a very good team, checking in at 20th overall in KenPom rankings. Seton Hall is hardly bad at 56th, their defense is a top-50 unit and they're especially good at stopping three-point shooters, which is why I don't want to lay the points and I'm combining them with Nevada, a team that played bored all season long against a Florida team that I don't think is very good. I think Wofford will be ready and willing to show they belong and they're being undervalued in this tournament and they come out firing, determined to let everyone know they belong with the big dogs. Pun absolutely intended. The SportsLine Projection Model has a strong play on the Florida-Nevada spread cashing in 56 percent of simulations, but the strongest play in that game comes on the total, with one side cashing 73 percent of the time. 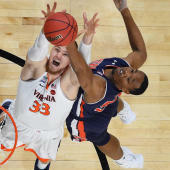 Head over to SportsLine to see those picks from the model that has returned over $4,000 to $100 players on its top-rated college basketball picks. The job Scott Drew's done with this Baylor team is really impressive, and it wouldn't be shocking at all if they put some kind of run together because Drew is also an excellent tournament coach. You know who else is an excellent tournament coach? Jim Boeheim, whose zone defense has created issues for opponents for years in the NCAA Tournament. The Orange are a tournament zombie with that defense, and given that Baylor creates only 40 percent of its points from beyond the arc, there's reason to believe they won't be able to score at will from deep against Syracuse. Baylor's defense (75th, per KenPom) isn't good enough to slow down the Syracuse attack. I like the Orange to advance and would buy the point or go with the moneyline here for maximum value/minimum tournament shenanigans. When it comes to Syracuse and Baylor, SportsLine senior analyst Josh Nagel is on a monster run, going 15-3 in 18 picks involving either of those teams over the last two seasons. He's locked in a play on this matchup that you'll want to head over to SportsLine and check out.